One of the benefits of brokedom in BK is that we have intimate knowledge of the taste and texture of Pabst Blue Ribbon, that ubiquitous lager of dubious award-winning credentials. It is the default option at many a bar due to its bottomed-out price, and its inescapable association with those lovable, huggable hipsters (because who doesn’t want to be lumped in with this guy?). But we know you want more out of the world than just one can. And so it’s time to break free from those blue ribbons and embrace a post PBR-era. And there are plenty of other low-cost options. This we determined by slogging through them, one by one. With low budgets and thirsty gullets, we set out to answer the question: when it comes to the bottom-of-the-cost-ladder beers out there, which ones are the best? Our approach was academic—we collected a representative sample of 13 of the cheapest brews (we’re saving malt liquor for a future panel) available in Brooklyn and put them before a panel of eight diverse, educated (and mostly financially challenged) beer drinkers to blind taste test our way through this watery, gassy, mess. All beer prices are from the Thrifty Beverage Center at 990 McDonald Ave., unless otherwise indicated. Our eight-member panel consisted of a beer industry expert (Ryan Clement, who manages the beer section at Trader Joe’s Brooklyn), a home brewer, a budget conscious journalist (holla! ), several beer enthusiasts, a guy who only had his first beer a year ago and one person representing the very important “female” demographic. We ranked each beer on a 10-point scale in terms of taste, appearance, overall quality and drinkability, a word we’re pretty sure was made up for Bud Light ads. We’ve also standardized the per-ounce price for ease of comparison. 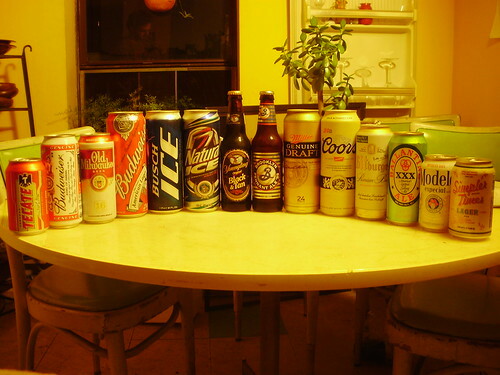 This entry was posted in brooklyn, clips and tagged brokelyn, cheap beer, clips, PBR, tasting panel. Bookmark the permalink. As a self-proclaimed malt liquor expert, I would like to join in the upcoming test. Chance of mildew sucking: 100%. Dude, you can be the centerpiece of the panel. Let’s talk logistics. We just can’t leave the bottles in the windows for the neighbors to see. I’ve had one Bitburger. That was my last Bitburger. Appalling; horrible. Surprised about the Tecate score, though it was without the benefit of a lime. Old Milwaukee I like. Maybe one or two, lest I spend the following day on the pot. But that stuff, no matter your criticism, tastes like REAL BEER.